Pinterest only recently started giving us access to the analytics behind our marketing efforts for Pinterest business accounts. The new analytics tool gives more stats on engagement within your Pinterest profile, like being able to track actions that originate from your profile and actions that result in traffic to your website. This is crucial because it allows you to see where your efforts are being rewarded to maximize your presence on Pinterest, and ultimately the presence of others on your website. First and foremost, if you want to dive into Pinterest Analytics then you'll need to make sure your account is a business account. For those just starting Pinterest for business, it's really easy to convert your account to a business account. Next, I would personally recommend that you include a Pinterest widget on your website or a 'Pin It' button (especially if you're in the retail business or have lots of image-based content on your website); you can build those buttons here. Once you're account is set up, it's time to analyze your efforts. 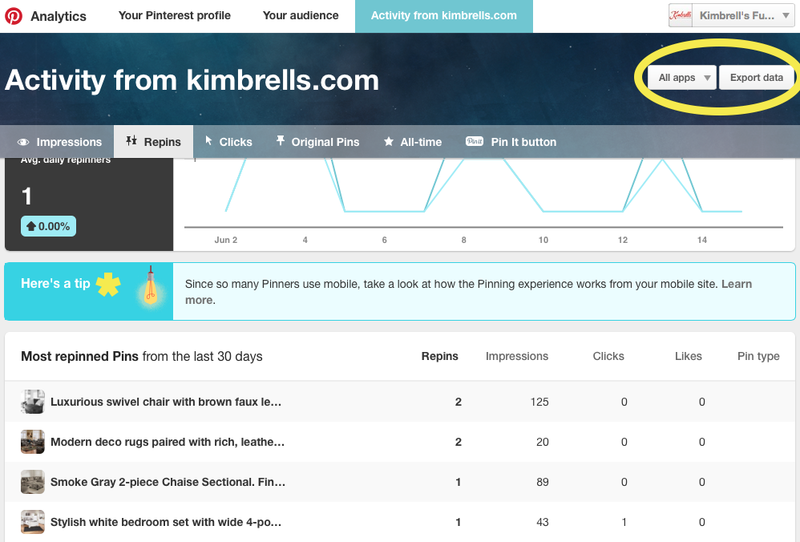 Your Pinterest Analytics dashboard will contain 3 major categories: your Pinterest profile, your audience & your activity from your website (for this demonstration we are using Kimbrell's Furniture's Pinterest Analytics). Underneath those categories will be a box of your 'Top Pin Impressions' from the past 30 days, showing you which pins that you've pinned in the last month that received the most impressions, repins, clicks & likes. Now let's explore the categories a little further. This section gives you a little more detail in what's actually going on with your Pinterest profile. With 4 sub-categories-Impressions, Repins, Clicks & All-time, you can see which pins are getting the most traction with your audience. The impressions section will give you data on which pins showed up on your audience's feed the most. The repins section will give you data on which pins were repinned the most. The clicks section will give you data on which pins got the most clicks (which hopefully most of them link back to your website). And the all-time section gives you data of which pins have done the best over-all. You have the option to view your analytics from the past week, the past 14 days or the past 30 days, depending on the timeframe in which you wish to analyze. The 'Your Audience' section basically dives into the demographics of your audience and what they're interested in based on what they are pinning from you and overall. You can see how many monthly/weekly viewers you get on average and what percentage of your audience is engaging with your profile. This section also categorizes your audience by country, gender, metro-area and language, which is extremely beneficial when creating a strategy for your Pinterest account. My favorite part about the audience section is the 'Interests' tab that shows what your audience is pinning and what they are interested in overall. This particular data (see below) shows that the audience is interested in Home Decor, Recipes, DIY, Furniture, Design, etc., which is right on target for a furniture store. For beginners, if you're only pinning stuff directly from your website, this is a great tab to use. It kind-of prompts you on things you could be pinning to gain more traction. For example, if Kimbrell's Furniture was only pinning their furniture, it would be a good idea to make a 'DIY' related board and a 'Food' related board to spice things up for our audience. Looking at the same ole' stuff can be repetitive, pushy and boring. This is by far the best thing Pinterest could have done for businesses accounts. Using this analytics tool to see how many Pinterest users are visiting your website will really prove your marketing efforts within Pinterest. This category also has sub-categories: Impressions, Repins, Clicks, Original Pins, All-time & the Pin It button. 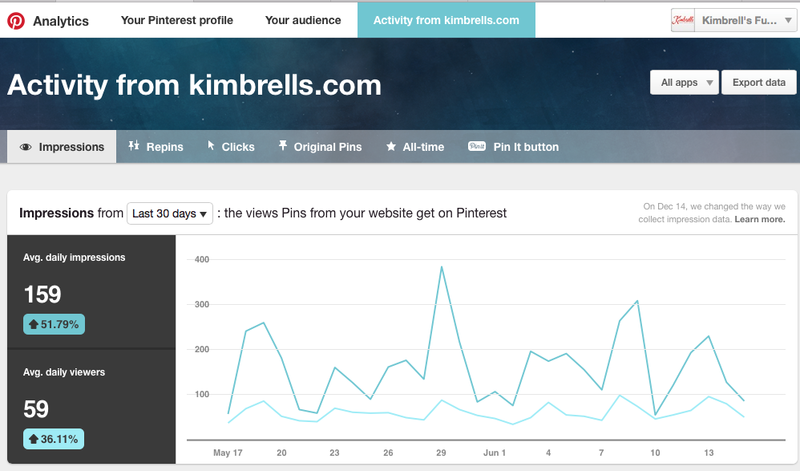 This will help you analyze different areas of your Pinterest efforts. This section is a great way to find out which pins are resonating with your audience the most so that you can create more content like this. The Pin It button sub-category can only give you data if you build the widget and add it to your website. If you take the time to do that, you can see how many impressions and clicks have been made through your website and see how many times stuff from your website has been pinned directly to Pinterest. Throughout analyzing these 3 major categories, you have the option to filter your data based on the devices that your audience is using to engage with your Pinterest account, whether it's a laptop, a mobile device or an iPad. This is helpful where image sizes are concerned. In the image below, you can see that Pinterest Analytics also provides tips in several areas to help you optimize your marketing efforts. You also have the ability to 'Export Data' from the analytics to create reports when needed. Have you used Pinterest for business yet? If so, share your thoughts or helpful hints!